The Department of Civil Engineering of BUET provides its students with the best labs for all the four majors: Structural Engineering, Geotechnical Engineering, Transportation Engineering and Environmental Engineering. The labs are kept under the supervision of senior Professors with the help of highly skilled and experienced lab assistants. Below is the slight overview of what to expect from the laboratories of this department in terms of lab equipment and the tests carried out there which by no means covers the entirety of the labs. The laboratory is housed on the ground floor of the Civil Engineering Building and has a floor area of 6,000 sqft. This is the largest structural engineering testing facility in the country equipped with modern testing machines and equipment. Routine strength tests of various materials like steel, timber, plastic, rubber etc. are carried out in the Structures and Materials Laboratory as per the relevant standards. On-site nondestructive strength evaluation is also conducted. Some of the testing machines include ten universal testing machines with various capacities, of which four have a capacity of 200 ton, impact testing machine, compression testing machine for beams (capacity: 10 ton), column buckling test frame, hardness tester machine etc. A few of the many tests carried out in this lab are tension test including wt. 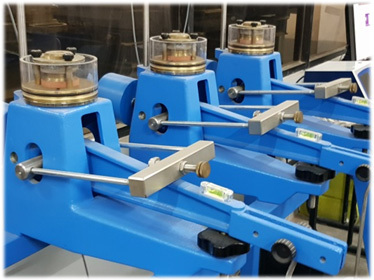 and elongation, bend test, HT wire tension test, impact test, prestressing wire and anchorage test, hydraulic jack testing and calibration in the 1000 ton reaction frame etc. It is situated on the ground floor of the Civil Engineering Building, just beside the Structures and Materials Lab., having a floor area of 6,000 sqft. Routine strength tests of various materials like concrete, brick, cement etc. are carried out in the Concrete Laboratory as per the relevant standards. On-site nondestructive strength evaluation is also conducted. Four compression testing machines with capacities of 200 ton, two concrete mixers, two masonry saws, stone cutting machine, curing pond, dry-heat sterilizer, pipe- testing machine, concrete core cutter etc. are the most commonly used equipment in this lab. 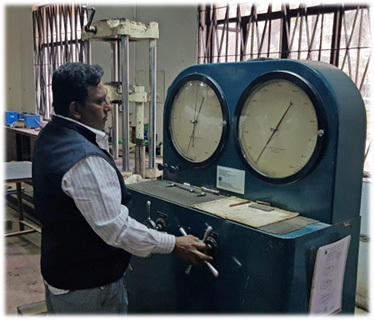 Various tests of cement are carried out in this lab that include initial and final setting time, compressive strength at different ages, sp. gravity test, fineness etc. Tests on brick include efflorescence, salinity, compressive strength, water absorption etc. 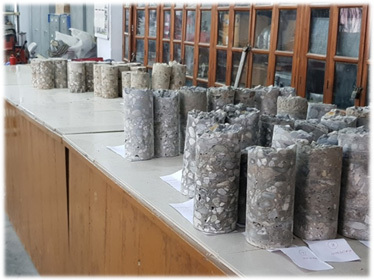 Other tests are sieve analysis of fine and coarse aggregates, determination of unit weight, fineness, sp. gravity and absorption of fine and coarse aggregates etc. 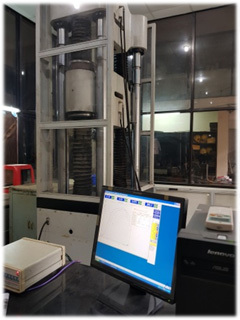 The concrete laboratory also houses two frame testing machine where load test on various scaled down models of frame structures are carried out as part of the research conducted by the faculty members and students. There are a modern computer controlled shaking table and a locally made shaking table that enables students and teachers to conduct research on seismic design of buildings and structures. This laboratory with a floor area of 2,800 sqft is on the 3rd floor of the Civil Engineering Building. The well-equipped laboratory is the most advanced of its kind in the country and have equipment, facilities and highly experienced laboratory technicians for detailed analysis of water, wastewater, industrial effluent, oil-drilling mud and cutting, air and noise quality etc. The laboratory also facilitates the model testing of water and wastewater treatment systems. Two UV spectrophotometers, double distillation machine, deionizing water machine, automatic dehumidifier machine, COD reactor, sonicator, IC machine, titrator, electrical water bath, flocculator, TCFC and BOD incubators, fine particle sampler, two atomic absorption spectrophotometers and many other testing machines and equipment are available for conducting academic and research activities. Routine drinking water parameters are tested here regularly, as well as, environmental quality of soil, sludge and solids etc. Other water quality parameters like TN, TKN, TS, TSS, TDS, TOC, DOC, SDI with plugging etc. are few of the many other tests performed regularly in this laboratory. 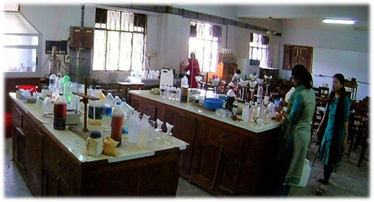 This laboratory is situated on the ground floor of the Old Academic Building and has a floor area of about 2,000 sqft. 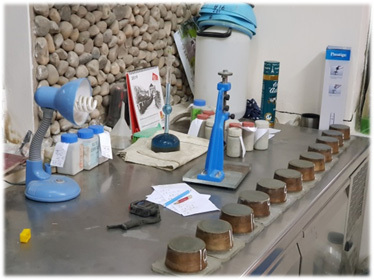 This laboratory is providing testing, services in diverse areas including quality control and testing of highway materials such as aggregates, bitumen etc. The lab is equipped with Los Angeles abrasion machine, compression machine (for ACV/TFV), AIV machine, Marshall compactor, Marshall tester, Marshall mixer with isomantle heater, penetrometer, ductilometer, cleveland open cup (for F&F Points), softening point test set, dynamic viscometer and many more. 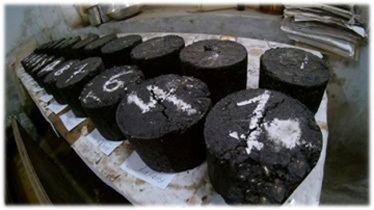 Tests like sieve analysis for coarse and fine aggregate, unit wt., void ratio, porosity, Moh. Hardness are routinely carried out in this lab. The Geotechnical Engineering Laboratory is located on the 2nd floor the Civil Engineering building with a floor area of 4,250 sqft. 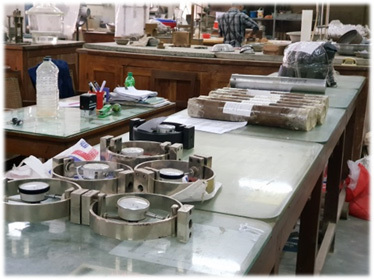 The well-equipped undergraduate and postgraduate laboratories of the Geotechnical Engineering division have facilities for detailed testing and analysis of soils, rocks and geotextiles. Moreover, the postgraduate laboratory has computational facilities for the design, analysis and research of wide range of geotechnical problems. Unconfined compression test machines, eight consolidation testing machines, four tri-axial machines, cyclic triaxial machine, CBR compaction machine, geotextile UTM (capacity: 60,000lbs) are some of the many existing equipment in this lab. 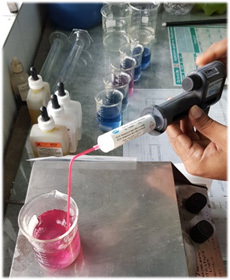 Some of the tests that are run here are specific gravity test, unit weight test, void ratio test, moisture content test, linear shrinkage test, liquid limit and plastic limit tests, st. proctor compaction test, unconfined compression test, CBR of soil test, consolidated drained test for sand and clay etc. 6. Traffic Engineering and GIS Lab. Traffic Engineering and GIS (Geographic Information System) lab is housed on the 4th floor of the Civil Engineering Building and has a floor area of 1,700 sqft. It facilitates analysis and interpretation of field traffic studies and observational works of traffic behavior which form an essential part of theoretical/ sessional courses as well as research in the fields of traffic and transportation engineering, both at undergraduate and postgraduate levels. It also facilitates detail geometric design of road links, bridge approaches, intersections, signals, modelling for the study of traffic and pedestrian behavior, synthesis of alternative traffic schemes. This laboratory is being equipped further with modern tools such as GIS, remote sensing technology, computerized traffic signaling, video image processing and devices for measuring and monitoring the road environment. 7. Survey and Photogrammetry Lab. The Survey and Photogrammetry Laboratory is located on the 5th floor of the Civil Engineering building with a floor area of 2,500 sqft. It is equipped with all basic instruments for conducting conventional surveying with modern equipments. In addition, it has the state-of-the-art electronic distance meter, electronic digital theodolite, electronic total station, automatic level and stereoscope for aerial photogrammetry. The Undergraduate Computer Laboratory was initiated in 1986 with only one IBM 8088 computer. Now it has grown into a well-established computer laboratory equipped with 150 personal computers in two rooms. Undergraduate students use this computer lab for various courses to learn AutoCAD, MATLAB, Building Design, Bridge Design etc. offered through different courses. The computers in this lab have registered version of modern structural analysis software like ETABS and SAP2000, MATLAB, AutoCAD etc. The post graduate computer lab has about 15 workstations equipped with personal computers and software. These computers are used by the post graduate students for research purpose. The computers in this lab have registered version of modern structural analysis software like ETABS, SAP2000, DIANA, STRAND7, STAAD Pro. etc.